I’m definitely channeling summer vibes with this one. I’m sorry to be bringing up the weather, but I think we can all agree that it’s time we had a bit of consistent sunshine here in the UK. It’s been fairly warm, but we’ve had enough rain already! But! 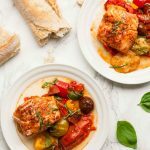 Even if the sun doesn’t show it’s face around here anytime soon, you can certainly brighten up your day with these delicious Roasted Heirloom Tomatoes with Cod and Chorizo! I’m the kind of crazy person who squeals when she sees unusual coloured and shaped produce. I’m not sure who decided it would be a good idea to breed everything with such…uniformity? Who really wants their food to all look perfect and evenly shaped? Where’s the fun in that! Give me all the funky colours and weirdly shaped veggies any day. 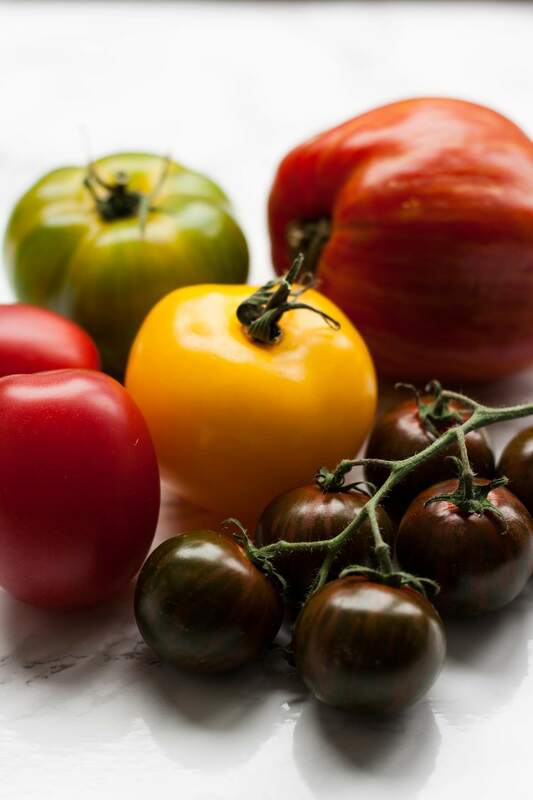 So when I visited the Whole Foods Market in Cheltenham a couple of weeks ago and saw a counter overflowing with beautiful British heirloom tomatoes, I had to fill my boots. Seriously, round red tomatoes are just nowhere near as fun as pink, green, yellow and stripy ones! Are you having a good weekend? As I write, I’m eagerly watching the men’s Wimbledon final. I’m the antithesis of a sports fan, but even I can’t help but get excited at this match! Come on Murray! Other weekend highlights: the new Biffy Clyro album! I don’t think I’ve spoken about music here before but take it from me now – I’m a big music lover. I’ve loved Biffy since the early years – every single album they’ve released has been incredible and Ellipsis is no exception! This has been on repeat in our house all weekend. Let me know what you think if you’re a fan! And if not, what have you been listening to this summer?! 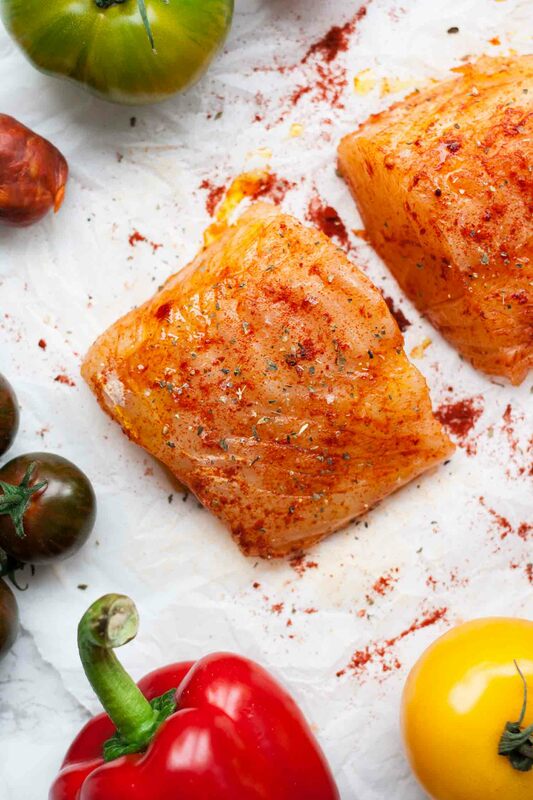 Let’s talk more about Roasted Heirloom Tomatoes with Chorizo and Cod. I first made this dish late last summer. I came across a bunch of gorgeous heirloom tomatoes in the local greengrocer and of course I had to have them. I wanted to treat them as simply as possible to really celebrate their incredible flavour. 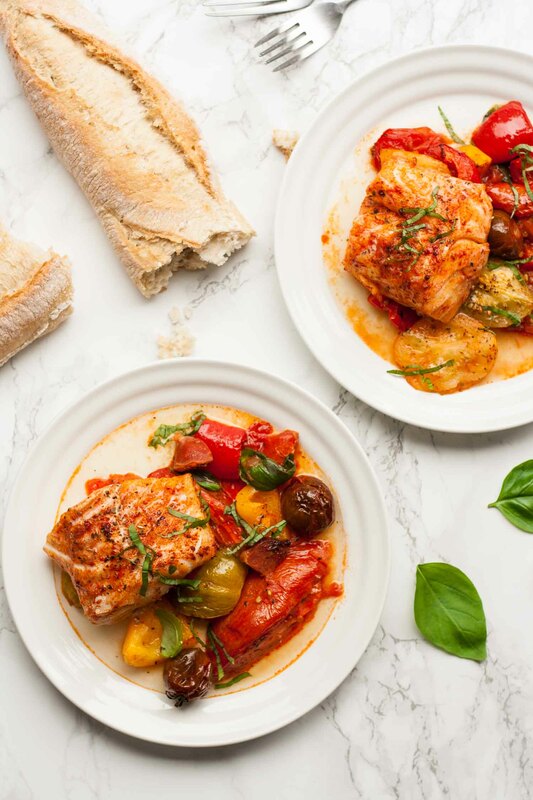 As my local greengrocer also happens to be a fantastic fishmonger I naturally envisioned a simple Spanish-inspired fish dish. And so this beauty was born! 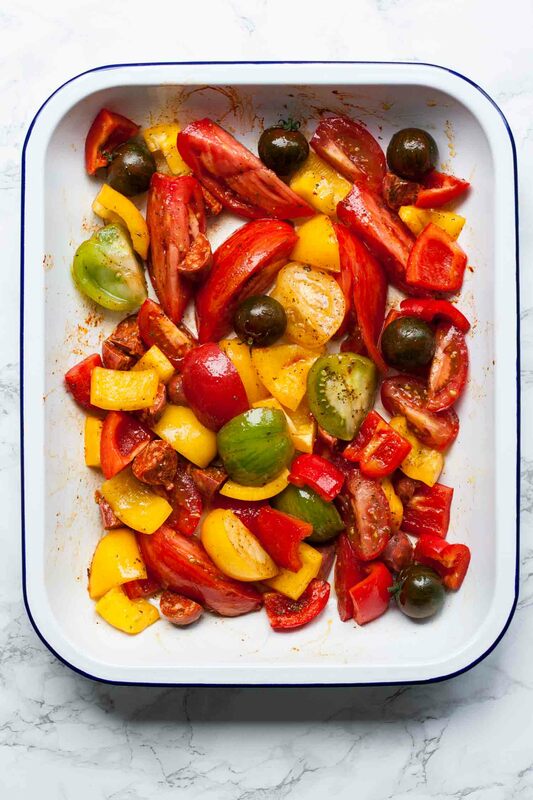 I’ve been waiting patiently to find some in-season heirloom tomatoes ever since so that I could make it for the blog and so here we go! Bell peppers add a touch more sweetness to the savoury tomatoes and the smoky chorizo brings everything together. 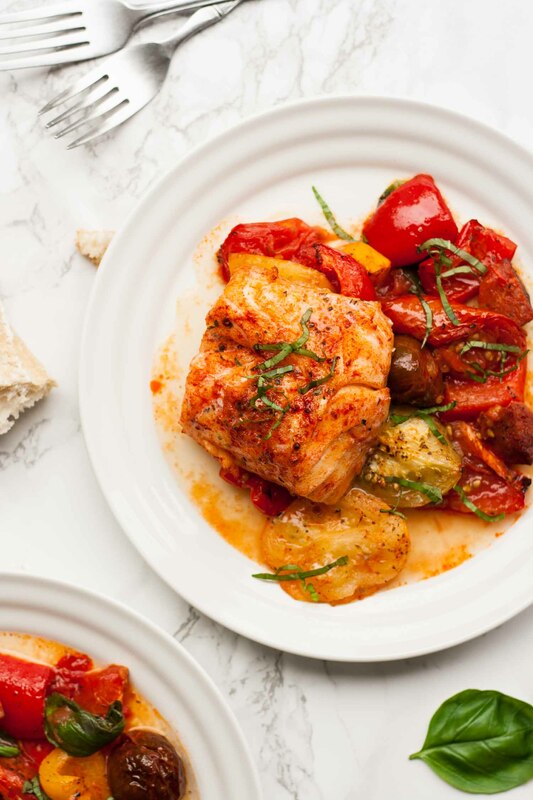 The flaky cod coupled with the soft roasted veggies is pure and simple food heaven. Don’t even think about making this and not serving it with good crusty bread! Something to mop up those delicious juices is non-negotiable. Okay? Good. Preheat the oven to 180°C (350°F). Chop the tomatoes into rough chunks, leaving any smaller varieties whole or halved. Chop the bell peppers into similarly sized chunks. Cut the chorizo into half moons or small chunks. Toss all of these ingredients together into a large tray and sprinkle with 1/4 teaspoon each of hot smoked paprika and dried oregano. Drizzle with 2 tablespoons of oil and season with salt and pepper to taste. Bake in the oven for around 20 minutes until softened. 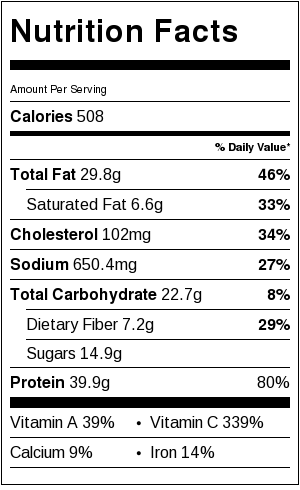 Cut the cod loin into two pieces. Sprinkle with a little more smoked paprika and oregano, salt and a drizzle of oil. Rub the spices and oil into the fish. 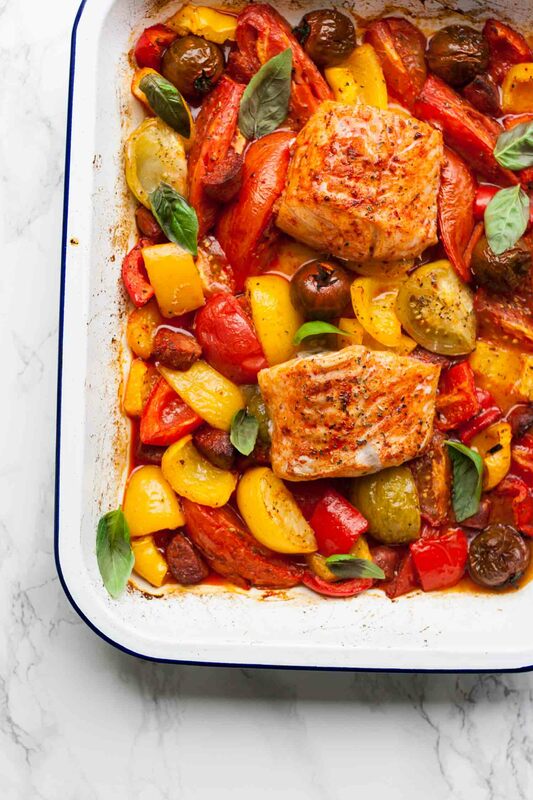 Place onto the softened tomatoes and return to the oven for 10-15 minutes, or until cooked through. Serve topped with fresh basil leaves and a chunk of good crusty bread. If you don't have hot smoked paprika, simply substitute sweet smoked paprika and a few chilli flakes. And if you don't fancy the heat, just use sweet smoked paprika by itself. It’s summer on a plate! This dish is just gorgeous! I’m not a huge tomato fan and I’m desperately trying to change that. Roasting them seems to do the trick, I love them all warm and sweet 🙂 Plus that crusty bread can only help!